start thinking about missing links in your wardrobe that would allow you to put more outfits together. 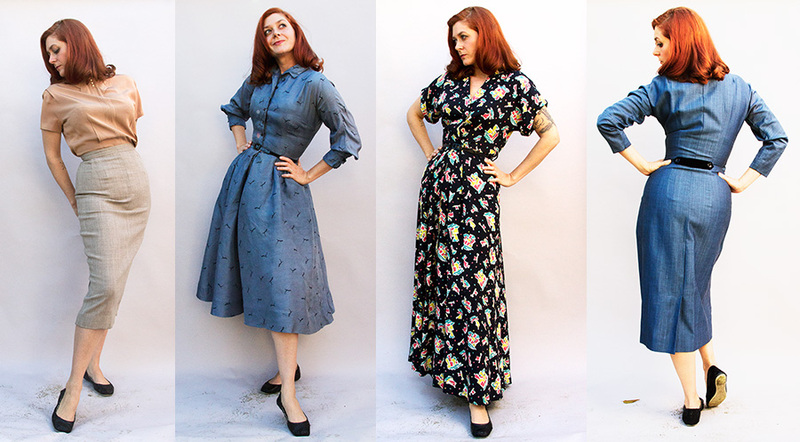 The most difficult part of this process for me is dealing with items that fit me well and look good, but don’t fit my life and/or style, particularly sweet floral dresses or 1940s novelty prints. They’re lovely, and they certainly have value, but they end up sitting in my closet because I feel self conscious whenever I put them on, like I’m dressing up as something I’m not. The truth is that something can objectively look good on you, but if it’s not your style and you don’t feel comfortable in it, it can be a waste of money and closet space, not to mention the fact that there’s probably someone else out there whose style it does fit who would love to have it. 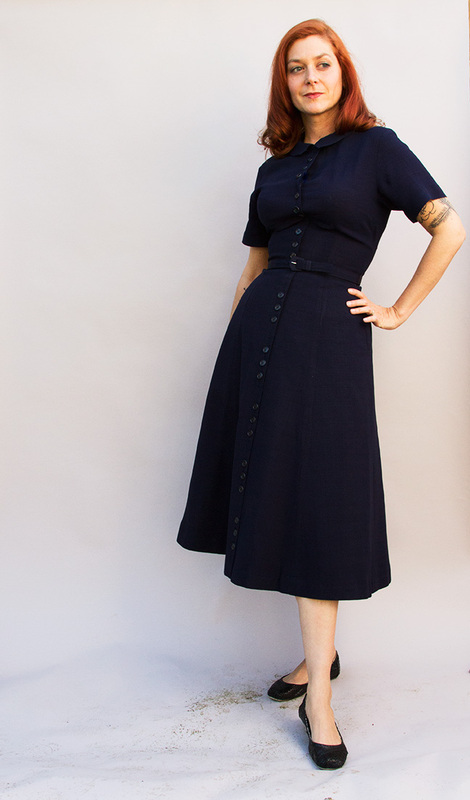 That’s one of the wonderful things about vintage – it doesn’t lose its value all that much by being used, as long as you keep your clothes in good shape, they only appreciate in value – and there’s an appreciative community always looking. I’m borrowing the concept of an outbox from the Apartment Therapy cure because it’s so effective: don’t worry for now where these things will go (we’ll deal with that later), just start a box or a section of your closet for things that you don’t love, need, and feel fabulous in. It’s not important that these things physically leave right now, just that they be set aside so you can focus on the things that will make up the core of your closet going forward. So what goes in the outbox? Or, another way of asking that question is what stays in my closet? if yes, ask does it fit, do I love it, does it fit my style? is it just a little bit too big or small? if yes, keep it. My weight fluctuations allow for me to wear a 25-27 inch waist, depending on whether I’m just a little off from my normal weight in either direction [2017 note: lol at me having a 26 inch waist back then]. It’s extremely helpful to have these options when I need them. Tailoring is also an option. if no, it could mean that the garment is fundamentally too tall or short for you, or just wrong in other proportions. Pay special attention when shopping to avoid this – bodice length, the distance between the collar or shoulder of the garment and its waist, is especially important. I know that a garment with a bodice longer than 16″ probably will not fit me, and will probably not be easily altered to fit. Also note a garment’s shoulder width, the distance between shoulder seams, where the sleeves are sewn on. Garments that don’t have shoulder seams are usually more flexible. Again, this can be a difficult thing to alter. Clothes can often be taken in at the side seams, but making fully fashioned garments shorter is more complicated if there’s no waist seam, or if there’s a zipper that spans the top and bottom of the garment. If you absolutely love it, take it to a tailor you trust and get a professional opinion. If an online seller doesn’t provide a bodice measurement, ask for it before you purchase, especially if you’re petite like me (5’4″ or under). is it a fancy outfit for special occasions? fancy outfits get a special pass. 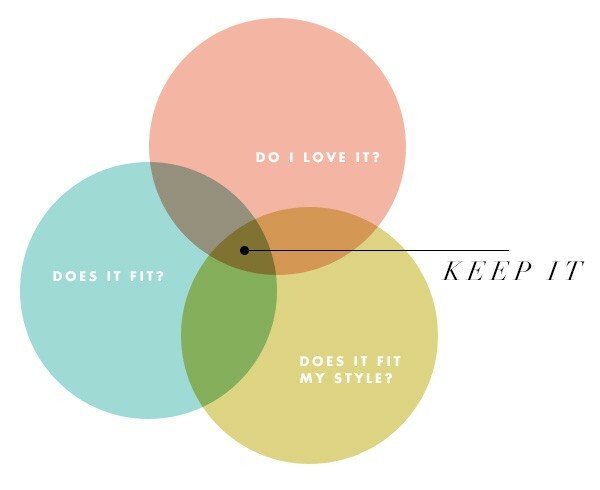 if yes, ask the three basic questions – does it fit, do I love it, does it fit my style? if no, think about why you haven’t worn it. Is it waiting for some special missing link to be able to wear it? For example, I had a black and white flecked pencil skirt that fit all criteria but I never wore it because I didn’t have a top to go with it. Once I filled in that gap, I wear the skirt all the time. Or is it waiting for a simple repair, like a separated seam or a missing button? Or have you just overlooked it and not tried it on in a while? If the problem were corrected, ask yourself the three questions. if yes, make a note of what you need to be able to wear it, whether that is a cleaning, a repair, or a missing link. I had a few things that are pastel, and very sweet, with beading and embroidery or other soft details. I had some novelty prints that felt too young, and definitely not simple or casual in my opinion. 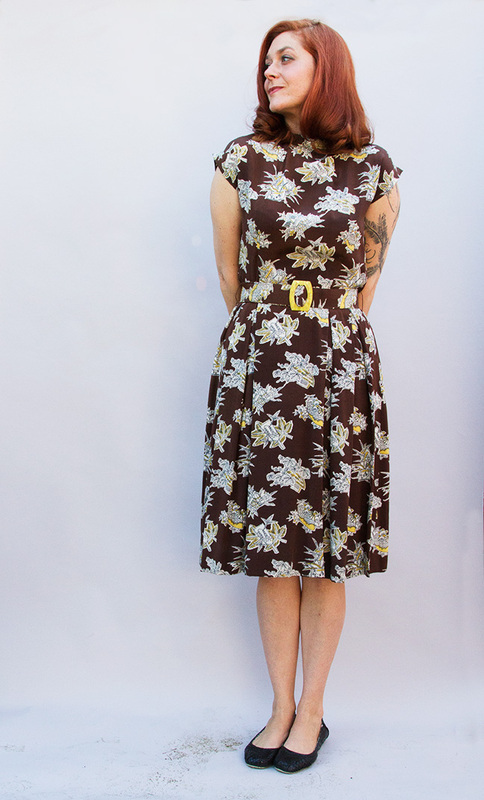 This 1940s novelty print rayon dress is in good condition and super cute, but I haven’t worn it in a year, and putting it on today felt uncomfortable. A sure sign that it’s time to go to the outbox. There are also some things in my closet that fit me and fit my style but I just never reach for them, even though they look good on me. Sometimes it’s because I’ve had them for so long that I’m kind of underwhelmed by them, and that’s another sign that it might be time to let someone else have a turn, or it’s a sign that I need to get it back into regular rotation. I’ve had this dress for ages, but it’s been in the repair pile for so long I forgot about it. I took it to the cleaners and it’ll be another trusty dress to wear regularly. Silk and rayon fibers with their smooth surfaces in a plain weave will reflect far more light than the rough course fiber of wool or the comparatively dull fiber of cotton, even though all were dyed in the same vat. But we’ll get more into those principles when we start shopping for realz. When you’re done, you might have a lot still standing, and you might have a lot of gaps to fill in. Don’t worry about this for now, just focus on what you’ve got and what notes you made along the way. Do you notice any themes? Are you missing clothes for a big contingent of your life, like casual clothes for running errands or business casual for the office? Would a basic black sweater help connect some pieces and give you more outfits, like it did for me? If you’re just starting out buying vintage, you might be staring at an empty closet and feeling somewhat daunted by the financial and emotional challenge of filling it up again. I get that for sure, but try to look at this point as an exciting opportunity to do things right and buy smart. But what do you wear in the meantime? Shopping for vintage, especially if you don’t have a good brick and mortar nearby, isn’t immediate gratification. It takes a lot of hunting and gathering, and time, to be sure. Since this isn’t a Stacy and Clinton situation, you’ll have to slowly replace those things in your outbox. This is fine, and may actually help sharpen your focus by looking at your old clothing in a new light. Next time, we start shopping. Tips for thrifting, online shopping, and shopping vintage brick and mortar. I’m not you in my vintage style, but I really love how you have defined your own and it suits you so well. 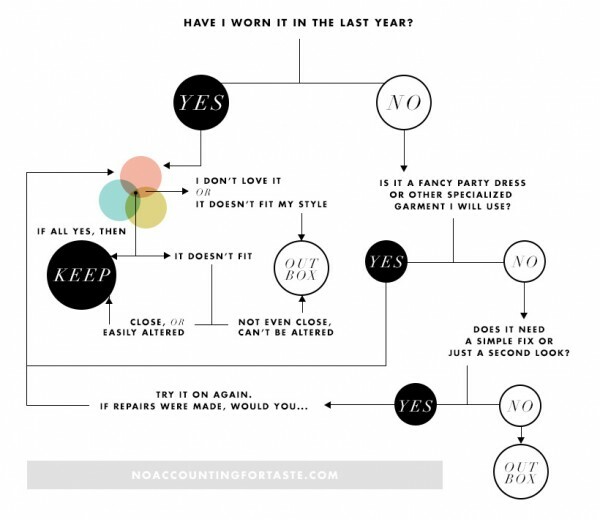 What a disciplined and organized approach to your wardrobe! Easily one of the most helpful reads on the subject I’ve run across.